This is part two of the MBTI for Writers Series—a quick overview of MBTI and how it works. See the character creation worksheets and the 16 personality types (and how to use them to write complex characters) in the rest of the series. You don’t have to be an expert in MBTI to create realistic characters with it. And who really wants to slog through walls of academic texts that use terms like dichotomies and tertiary every paragraph? Not that you wouldn’t understand it if you tried, but why should you have to work so hard? We don’t want to sit formal exams or write a master thesis on MBTI. We just want to harness it for our creative writing and fictional characters. Right? Right, so let’s break MBTI down into its simplest form so we can get to the good stuff (writing complex, ultra-realistic characters for our stories ). The mastermind behind MBTI is Carl Jung. He’s the smarter, less perverse grandpa of modern psychology who came up with another literary theory we writers love, Jungian Archetypes. His work here also inspired The Hero’s Journey. We writers owe a lot to Jung. Now, these break down even further depending on whether a person is introverted or extraverted. And this is actually where the magic of MBTI is for writers who want to write amazing characters for their stories. Because it’s where we get into where your characters really live—the functions. When we get down and dirty with each MBTI type later in the series, we’ll go into the different functions and what they do. We’ll also help you to “experience” each function so you can get inside your characters’ perspectives in your stories. For now, I just want to give you a sense for MBTI, that functions exist, what they’re called, and that this is what makes your characters 100% distinctly themselves. Sensing (when it comes to MBTI) is when we focus on the information that comes through our physical senses in the moment. Intuition is when we focus on the ideas and possibilities that occur to us. Thinking wants to put everything in order based on logic and cause/effect. Feeling wants to put everything in order based on the personal values of ourselves and the people around us. Introverted here means we focus on these functions within our inner world. Extraverted means we focus on these functions in what’s going on around us. Don’t worry. You won’t have to remember all of this to use MBTI for Writers. It’s just to give you a sense for what goes into the tool you’ll be using. And you can always come back to skim this later if you want to be reminded of something. 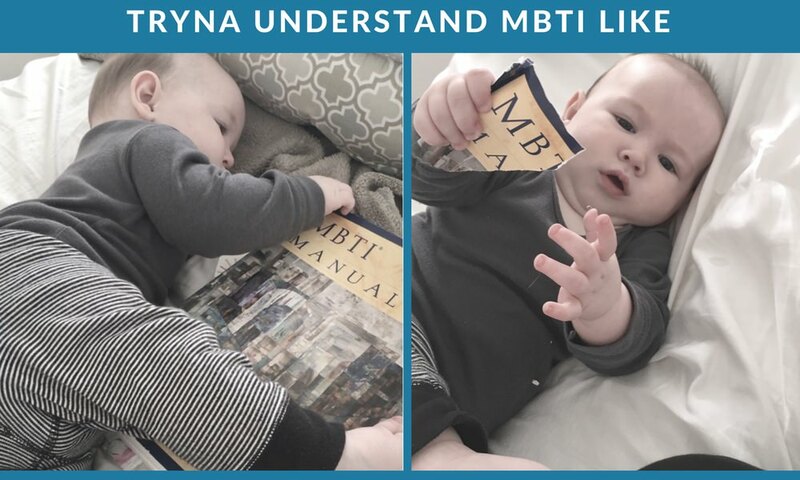 So this is cool and all, but if MBTI comes from Jung’s theories, why is it called Myers-Briggs Type Indicator? It’s 1923 and this ahead-of-her-time woman writer, Katharine Cook Briggs, stumbles upon Carl Jung’s theories about personality type. So she was pouring through the works of great philosophers and thinkers to build her own system for how the human mind works and expresses personality when she hit upon Jung’s theories. It fit so well with what she knew about herself and other people that she dropped her plans to build a new system for how people think and decided to just unpack Jung’s instead. I mean, the work was mostly already done so why not, right? Katharine’s daughter, Isabel Myers, jumped in when she saw how type theory could help people find jobs that suited them, see the differences among themselves as the positives they are, and generally live happier lives (awwww). Over the next 20 years, the two women observed type in others and ran assessments in medical schools. It was these two who developed the first MBTI self-assessment questionnaire into the system it is right now. So, basically, you and I are just using Katharine’s work for the reason she created it for in the first place…to create convincing, realistic fictional characters for our stories! In the next MBTI for Writers article, we’ll talk more about why MBTI is such an incredible tool for writers and some of the ways we can use it to write stunningly realistic characters who drive your story’s plot. Questions about any of this? Pop them into the comments below. I’ll be standing by to answer them. I pulled most of this information from MBTI Manual: A Guide to the Development and Use of the Myers-Briggs Type Indicator, 3rd Edition in case you are the academic type who loves terms like dichotomy and tertiary (hey, friend!). This manual is a great place to really get everything you could possibly want to know about MBTI. If you want more about literary archetypes and The Hero’s Journey, check out Christine Frazier’s Better Novel Project. Hey ! I liked your artical and I am curious About something i am currently writing a fantasy novel and my main character is fairy so Mbti can work to my character ? !